Our open-air Geodomes (both 'deluxe' and 'basic') are uniquely crafted from all local materials and positioned to maximize the lake experience. Book any one of our Geodomes and awake to the sounds of fluttering birds, cooing Cranes and gorgeous lake views right from bed! The 4 Deluxe Geodomes - Ebimoori, Emiizi, Eiguru (photo) & Omuti, are very private and fully furnished with sofas, chairs, sitting tables and shelves, and wicker furniture on your private balcony. All deluxe geodomes have private hot showers and eco-san latrines, and are arranged with a double & a single bed standard (w/room for two extra single beds if needed). There are also 3 Basic Geodomes, which are similar to the deluxe except smaller, less furnished and using shared facilities. 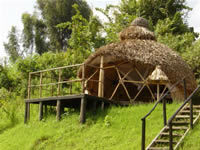 These include two doubles - Eizoba and Okwezi, and one twin - Eitaka (photo at bottom of page), all having classic views of the hills and lake from private balconies and with shared showers & latrines located very close by. All geodomes have mosquito netting and contain large lockers for securing valuables, and smaller items (cash, passports, etc.) may also be stored in lock-boxes in our office. The Amagara Cottage is our most luxurious accommodation, perfect for families, with 2 bedrooms plus sitting room, cool tiled floors, independent solar electricity & hot showers. It is fully furnished with king size bed & log bunk bed (2 singles), desk, sofas, wardrobes, large private shower & latrine, covered veranda with stunning lake views and a private lush garden with shade. The cottage is very spacious and comfortably hosts a family of five (4 adults max.). 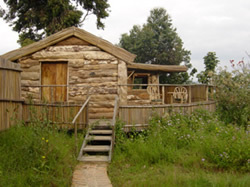 The Amaizi Cabin is our most secluded accommodation and with all private facilities (ie. hot shower & toilet). 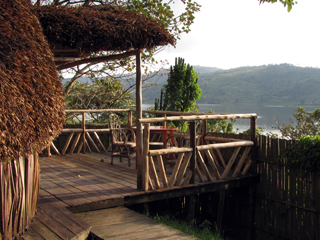 It is a log-cabin with offcut walls and timber shutters, papyrus thatched roof & a huge deck with 270-degree lake views. Inside are double & single beds with mosquito netting, and unique roll-up canvas windows to create an indoor breezeway. 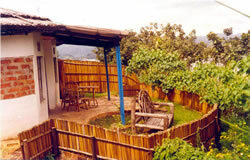 The cabin is also furnished with wardrobes, desk and cane sitting table and chairs. Amaizi Cabin can be arranged to sleep up to four people. 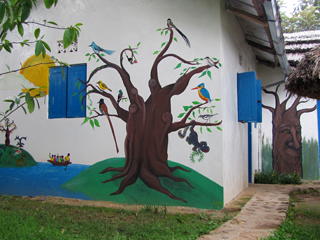 We now have 2 brand new dormitories! The 'Big Dorm' is a large room containing 12 beds with some minimal furnishings, and the 'Little Dorm' is a more private 4-bedded room, furnished with table, chairs & desk. Both dormitories have mosquito nets & large private lockers at each bed - the lockers are large enough to fit your entire backpack! These are basic accommodations with shared facilities (cold showers & toilets) very close by, and we have just installed a brand new bank of stone showers as well as clean and comfortable eco-san latrines. Hot showers are available on request for a small charge.